The Foreign Office is warning Britons travelling to Brussels to be "alert and vigilant" after the deadly attacks on the city's airport and metro. Two British nationals were among the injured, a spokesman confirmed. There are also concerns for David Dixon, an IT programmer from Nottingham, whose family said had not been seen since the attacks. Friends said Mr Dixon has lived in Brussels for 10 years with his partner and their young son. He travelled to work every day on the city's Metro, but has not answered his phone or made contact since the explosions. His partner Charlotte Sutcliffe spent the day driving from hospital to hospital in Brussels trying to find him. Twin blasts hit Zaventem airport at about 07:00 GMT on Tuesday, with 11 people reported killed. Another explosion at Maelbeek metro station near EU headquarters an hour later left about 20 people dead. 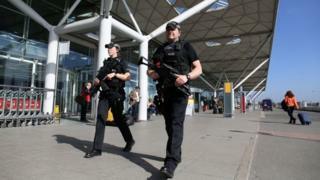 Security at ports, airports, Tube and major railway stations in the UK has been stepped up. David Cameron condemned the attacks, which have been claimed by so-called Islamic State, and warned of "a very real terror threat" across Europe. Specialist police from the UK have been sent to Brussels to help with the investigation. The prime minister will chair a second Cobra security meeting to determine the UK's response to the attacks on Wednesday morning. The Foreign Office said embassy staff were "providing consular assistance to two injured Britons and are ready to support any further British nationals that have been affected". Britons in Brussels were told "to remain alert and vigilant, and stay away from crowded places". An emergency number for those worried a relative may have been affected has been issued - 020 7008 0000. The UK's most senior counter-terrorism officer, Metropolitan Police Assistant Commissioner Mark Rowley, said increased police activity in the UK was a precaution and not in response to any specific threat. In London, he said, the Met Police were putting more officers on duty to carry out patrols at key locations. Home Secretary Theresa May said security checks at UK borders were being increased "to ensure public safety and provide public reassurance". She told MPs there would be more searching of vehicles and greater use of search dogs. The Belgian flag is being flown at half mast above Downing Street. Mr Cameron chaired an emergency Cobra meeting to determine the UK's response to the attacks, and said Britain would do all it could to help the Belgian authorities. "These are appalling and savage terrorist attacks and I've just spoken to the prime minister of Belgium to give our sympathies and our condolences to the Belgian people," Mr Cameron said. "They could just as well be attacks in Britain or in France or Germany, or elsewhere in Europe and we need to stand together against these appalling terrorists and make sure they can never win." Mr Cameron said UK authorities were continuing to review information coming in - and would raise the terror threat level if there was information of a direct threat. Airports are generally designed around a clear security "line" after which people pass into the "airside" area - in effect a security bubble. This protects the aircraft as much as the airport. The Brussels bombs were detonated outside the bubble, in the terminal before the security check. Passengers will wonder why there are no security scanners at the door of the airport, or the entrance to the car park. Should we move the line of security? The problem is that this simply moves the place where the queue forms. And queues are the ideal soft target for a terrorist. Ben Gurion airport in Tel Aviv, often cited as the world's most secure, relies on profiling. Passengers are closely watched and intensively questioned about who they are and where they are going. Some experts swear by it, but it has been criticised as "politically incorrect". The attacks come four days after Salah Abdeslam, a key suspect in the Paris attacks, was captured in Brussels. The Belgian federal prosecutor said it was "probably a suicide bomber" who struck the airport.